SO, HOW DOES THIS LIFE COACHING STUFF WORK? Life Coaching is definitely not a one-size-fits-all process. Through the various phases of the process, it will almost always evolve in a different way for each person. With this in mind; however, there are some basic structures to the process. Life Coaching sessions are done, mainly, over the telephone or over Skype, as this is an effective, yet economical way to work with clients from all over the country. Prior to the start of each session, an agenda is established to help identify opportunities, challenges, and focus of that particular session. Don’t worry, though, the agenda is not set in stone so it can definitely change and evolve throughout the session. WHAT ARE THE BENEFITS OF LIFE COACHING? There are numerous benefits to Life Coaching. The process is structured in a way that helps you clarify your own vision of what you want from your life, it helps identify your passions, and helps you develop an action plan to take the steps toward achieving your dreams! The Life Coaching process provides tools you need to bring about change, offers objectivity, a supportive ear, and accountability. The process might just challenge those long-standing limiting thoughts you could be holding onto, that no longer serve your highest good. Lower turnover in the workplace. Bringing about more harmony in relationships. Feeling better in overall health, wellness. Living life with passion and authenticity. Being empowered to create and design your life intentionally. HOW WOULD I KNOW WHEN TO HIRE A LIFE COACH? Are you searching for answers, looking for some direction? Going around in circles trying to figure it all out on your own? Feeling stalled or at a crossroad? Spinning your wheels? Do you feel an overwhelming sense that you are boxed in? People are ready for Life Coaching when their desire for learning and change outweighs their fears, and when they are ready to move forward in their own life. Hiring a Life Coach comes when a person reaches a point where they believe "There has to be something more to my life. I feel ready and willing to explore my true potential and take action to have my relationships or circumstances be different." Life Coaching can be one of the most productive, practical, rewarding, and fiscally responsible routes a person can take for creating more of what he or she wants in life. HOW IS LIFE COACHING DIFFERENT FROM COUNSELING OR THERAPY? Life Coaching is for people who are motivated enough to want more out of their life. It focuses on personal strengths and helps people set and reach their life goals. It is about dreaming bigger, living more boldly, and taking forward actions. Counseling and/or Psychotherapy is a healthcare service for people with diagnosed mental disorders. People who are experiencing severe emotional distress or marked functional impairment in one or more areas of their lives would benefit more from psychotherapy. While Life Coaching may actually use many of the same skills and techniques as Psychotherapy, Life Coaching is not a treatment nor a substitute for treatment for mental disorders. HOW LONG DOES LIFE COACHING TAKE? As previously noted, Life Coaching is not a one-size-fits-all process, so the length of time utilized with Life Coaching will differ depending on the needs of each individual client. Some clients may only feel the need for one or two sessions, while others may want multiple sessions, over a period of weeks or months. Sessions are goal-specific, so if a client has one specific short-term goal, a couple sessions may be a right fit for their needs. If a client wants to achieve dreams that have a number of components, or feel they need additional assistance in reaching a series of goals, then it will be important to them to have multiple sessions, over a series of weeks or even months. Depending on the number and complexity of a client’s goals, they might hire a Life Coach for three months, six months, a year, two years, or more. Basically, Life Coaching lasts as long as a client continues to receive benefit from it and has unmet goals. SO, DOES LIFE COACHING FOCUS ONLY ON WORK ISSUES, OR ONLY ON PERSONAL ISSUES? Life Coaching can be beneficial for personal or professional issues, or a combination of both. It really all depends on the needs of the client. There are many benefits to hiring a Life Coach. Remember, a happy, successful life is a balanced life! 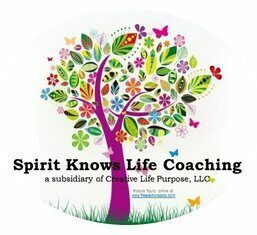 © Creative Life Purpose, LLC (parent company to Finding Your Divine Spark, Spirit Knows Life Coaching, and Talking With Toes).